In addition to manufacturing several models of in-room, in-wall, on-wall, and outdoor speakers, Paradigm Electronics offers the DSP line of powered subwoofers for stereo and home theater systems. The DSP-3200 subwoofer is considered the midline model in the DSP series of subs. The DSP-3200 is a bass reflex subwoofer that features a 12-inch Aramid-fiber Polypropylene cone, a 2-inch voice coil and a 300-watt RMS (sustained power) Class D amplifier. In case you're new to the term, Aramid fiber (think Kevlar) is a synthetic material known for its heat resistant properties. The built-in driver uses a large rubber surround to permit extended woofer excursion. And the enclosure itself features dual front-firing ports for efficiency, which also allows placement flexibility. Line level and speaker level inputs are provided so the DSP-3200 can be connected to the Sub-out/LFE output or to the speaker level outputs of a receiver or amplifier. The built-in crossover is variable from 35 to 150 Hz, and the variable phase control can adjust from zero to 180 degrees. The crossover also has a bypass option—an important feature if the crossover in the receiver or processor is used instead of the subwoofer's crossover. Enclosure construction is solid with good fit and finish. The Paradigm DSP-3200 is available in four finishes: Rosenut, Black Ash, Wenge, and Cherry. Dimensions (H x W x D): 18 ¼" x 14" x 19 ½"
The break-in period for the Paradigm DSP-3200 consisted of watching the entire six-disc set (24 episodes) from the first season of the Fox show 24 over a rainy-weekend DVD marathon. 24 is recorded in Dolby Digital 5.1 with a compelling soundtrack that uses bass effectively to heighten the drama and suspense. 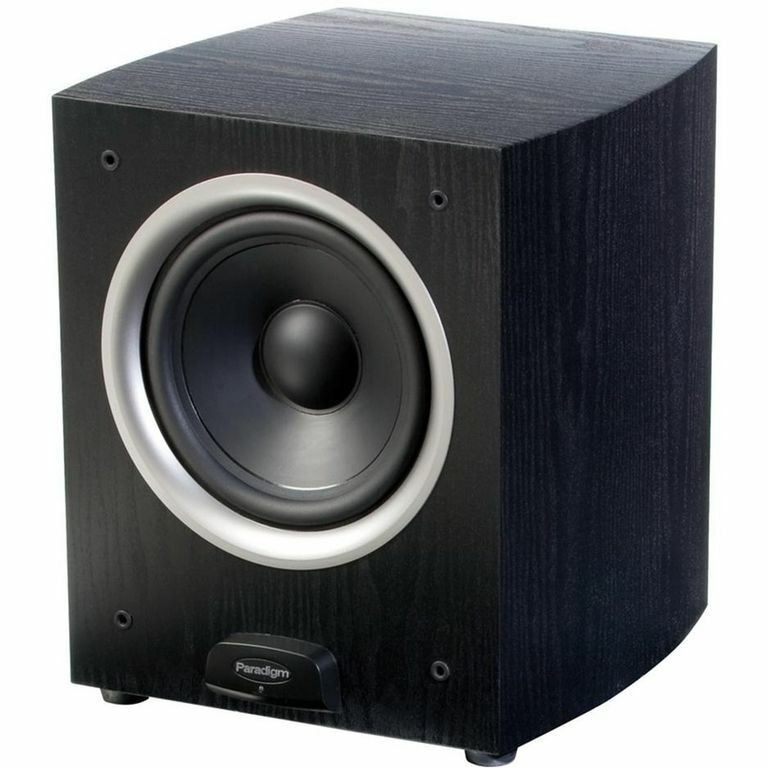 The Paradigm DSP-3200 subwoofer produces deep, visceral bass that engages the viewer in the story. Bass never sounds heavy or boomy, just low and tight with good extension and depth. It's one of the best subs we've heard hooked up in a system. While listening to stereo music, the Paradigm DSP-3200 outperforms many other subwoofers we've tested. Oregon's Rewind (Chesky Records) has a bass track with unusual depth that the Paradigm reproduces with excellent extension, never reaching the point of sounding tubby or heavy. The Paradigm DSP-3200 is one of the best subwoofers you can get for the money. With solid, extended bass response and affordably priced for the power, one can't ask for much more. It's a great value for a stereo or home theater system. This subwoofer is taller than other models, so don't plan on stuffing it under a chair or couch. Besides, to get its maximum performance you'll want the flexibility to place the subwoofer in the best location in your listening room.